Cisco Systems has said it is shutting down its Flip video camera business and cutting 550 jobs as it overhauls its consumer products unit. In recent years, Cisco, the world's largest maker of computer networking gear, has sought to diversify and move into the consumer market. Analysts criticised the group for trying to do too much. Last week, Cisco chief John Chambers admitted the firm had lost its way and vowed to take "bold steps" to refocus. "We are making key, targeted moves as we align operations in support of our network-centric platform strategy," Mr Chambers said in a statement. Cisco bought Pure Digital Technologies, the maker of the Flip camcorder, for $590m in 2009. 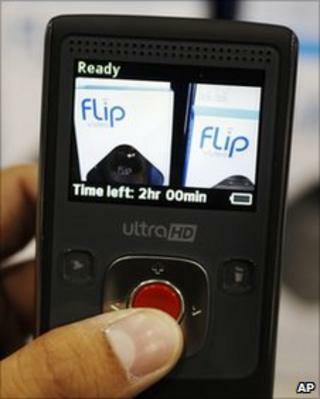 The Flip quickly became a top seller thanks to its ease of use, with its signature feature a USB connector that flipped out of the case, allowing the camera to be connected directly to a computer. "They announced they are shutting it down, so that implies that they were unable to sell it," said Philip Alling, an analyst with Atlantic Equities. "It's disappointing they wouldn't be able to generate any proceeds from a sale of the business." But Tim Ghriskey, chief investment officer of the Solaris Group, said: "This is one step in concentrating the focus of Cisco on the enterprise. This came faster than we would have expected, but perhaps Cisco has been studying this for a while." He added that the company may be restructuring its consumer business so that it can sell the division. Can Cisco turn the downturn into opportunity?